Sensor Operated Centerset Deck Mounted Faucets Are Hygienic Touchless Fixtures For Hotels, Commercial Lavatories And Washrooms. 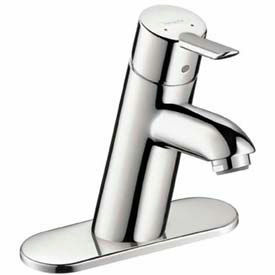 Sensor Operated Centerset Deck Mounted Faucets are crafted with brass, stainless steel and chrome for long lasting durability. Faucets are easy to install with mounts powered by surround sensor technology. Activation occurs whenever a hand comes within a few inches of the faucet. Available styles are Above Deck Mixing Valve, Below Deck Mixing Valve, Below Deck Thermo Mixer, Faucet Only, and Faucet w/Mixing Valve. Available with 2 or 3 Faucet Holes. Color finishes are Black/Chrome, Chrome, and Polished Chrome. Dimensions and power supplies vary per model. Centerset Deck Mounted Lavatory Faucets Are Available In Several Different Styles To Fit Restroom Décor In Hotels, Restaurants And More. Centerset Deck Mounted Lavatory Faucets are offered in a wide range of styles, sizes and configurations to fit in with any bathroom décor. Handle options include single level, double lever, double cross handles, double blades, double wrist blades and push buttons. Faucets come in 1/2" connection and 3/8" connection sizes for installation in 1, 2 or 3 hole setups. Centerset deck mounted lavatory faucets are available from several trusted brand names. Single Hole Deck or Wall Mounted Faucets Are Used For Home Builders, Contractors, Kitchen Or Bathroom Remodelers And More. 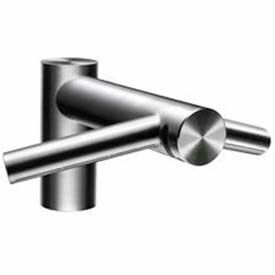 Single Hole Deck or Wall Mounted Faucets are made of solid brass construction with corrosion resistant Brushed Chrome, Polished Chrome or Venetian Bronze finishes for long lasting durability and dependability. 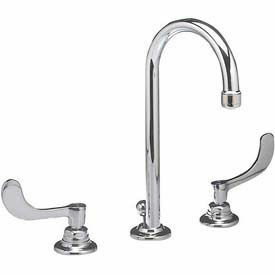 Various recognized brands offer a wide selection of Single Handle or Sensor type faucets for easy single or hands-free operation in commercial or residential kitchens or lavatories. Faucet Only and Above or Below Deck Mixing Valve styles are available with 3-7/8 to 7-7/32 inch spout reaches, 2-1/2 to 7-7/8 inch heights and are designed for installation without or with 4, 5-3/4 or 8 inch deck plate. Solar Powered Deck Mounted Faucets Transform Light Into Electrical Energy. Solar Powered Deck Mounted Faucets are manufactured with Brass, Chrome, Nickel and Stainless Steel for long lasting durability. Solar powered, sensor activated electronic hand washing faucets control pre-tempered hot and cold water operation. Optimal performance is maintained in sunlight or artificial light. The unique "Solar Energy Module" utilizes any light source efficiently. Modular design incorporates all of the operating components of the faucet, including the sensor, solenoid, circuitry and solar energy module above the sink within a die-cast metal spout. Single and Dual control models are fitted with Lever, Deco Lever, Scroll Lever, Sculpted Lever, Wristblade, Sculptured Acrylic and Standard Cross handles. Functional Pop-Up Drains are featured in most models. 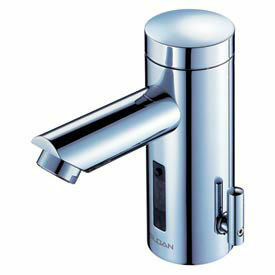 Widespread Deck Mounted Bathroom Faucets Are Perfect For Restrooms In Hotels, Restaurants, Offices And More. Widespread Deck Mounted Bathroom Faucets are offered in a wide range of styles, sizes and color finishes to mesh with classical or contemporary décor. Choose from blade, lever, cross and pushbutton handle styles. Water speeds are 1.5 up to 2.2 GPM. Widespread Deck Mounted Bathroom Faucets are offered from several trusted brand names. 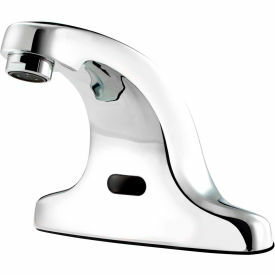 Single Hole Deck Mounted Bathroom Faucets Are Perfect For Restrooms In Hotels, Restaurants, Offices And More. 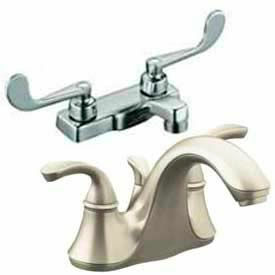 Single Hole Deck Mounted Bathroom Faucets are available in a variety of styles to match any restroom décor. Mounting hardware included. Available with Single-Lever or Pushbutton operation. Choose from a variety of different finishes. Vessel Sink Faucets Are Used For Updating Any Bathroom Look While Offering Drip-Free Operation. 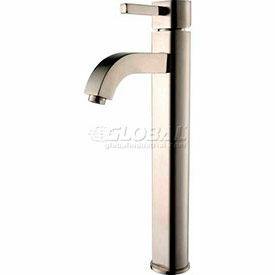 Vessel Sink Faucets are made of brass for long lasting durability. Ceramic disc valving offers drip-free operation for greater reliability. Hot Limit Safety Stop reduces the risk of accidental scalding. Single lever design. Grid drain style. Color finishes are Chrome, Oil Rubbed Bronze, Satin, Satin Nickel and Stainless Steel, . Spout heights range from 3-16/18 in - 11-9/16 inches. Spout reaches range from 2-11/16 to 4-7/8. Package quantity is 1. 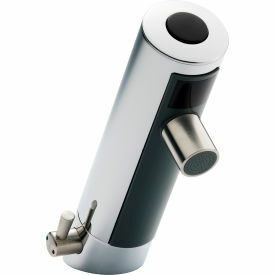 Dyson Airblade® Tap Allows Users To Wash And Dry Hands In One Area. With Airblade® technology in a tap, hands can be dried at the sink in 14 seconds. Water isn't dripped on the floor with Dyson Airblade Tap hand dryer because you don't need to move to a separate drying area. Costs less to run and has a small carbon footprint compared to other hand dryers. Saves space and features touch-free operation.